Tyropita (pronounced tee- ROH -pee-ta) from tyri = cheese and pita = pie and Strifti (pronounced stri-FTEE), which means twisted. It takes it’s name from the way the cheese pie is shaped. This pita (pie) is made in Northern Greece, known as Kozanitiko Kihi and it is baked in the oven. The homemade phyllo is crispy and crunchy but it can also be made with store bought phyllo. A similar pita is made called Skopelitki or gianniotiki have the same shape but these are pan fried instead. This is one of the most delicious cheese pies , which was made by my daughter, with an extra crispy homemade phyllo, which she made from scratch and a filling of feta and anthotyros, which is a whey cheese, similar to ricotta! If you follow my recipe with video showing you How to make Dough and step by step videos for Making the phyllo with a rolling pin or even much easier using the pasta machine you will never buy ready made phyllo! The amount of dough is for two round baking tins 30 cm in diametre and half the amount of cheese is added in each one. You can make one larger one if you have to feed a crowd or even make it in a square or rectangular baking tin by placing each twisted roll next to each other. You can also add an egg in the filling if you like and if you don’t like mint and pepper, you can leave them out. You will need dough to make phyllo. You can make your own phyllo following the links above or use store bought phyllo. If you join the coil it will make a nice spiral but I prefer to keep it spaced apart so that all the roll is baked evenly. If using a square or rectangular baking tin, place it next to the other in a row, preferably again spaced apart. 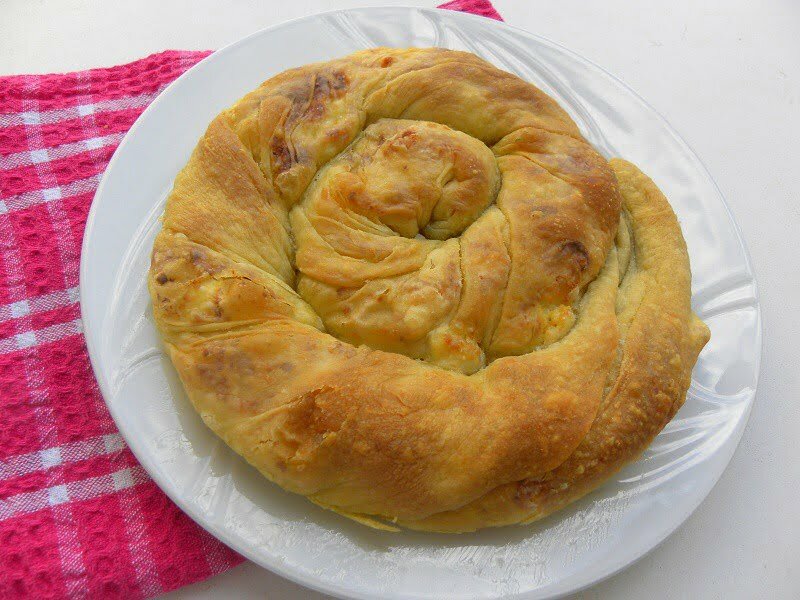 You can use any kind of Greek cheese to make a Tyropita. Feta is the star but as feta is salty you can mix it with anthotyros to balance the saltiness. More cheeses, like graviera, kasseri, halloumi, etc can be combined with feta. If you cannot find any of the above cheeses try using, Gouda, Gruyere, ricotta, pecorino etc. Usually nothing else is added in the filling apart from feta. However mint and pepper are a wonderful combination which I urge you to try. Tyropita (pronounced tee- ROH -pee-ta) from tyri = cheese and pita = pie and Strifti (pronounced stri-FTEE), which means twisted. It takes it's name from the way the cheese pie is shaped. Take a piece of dough the size of about a tennis ball and form it into a ball. Flatten it and roll it out to make a thin phyllo. See video How to make homemade phyllo. Crumble the cheese using a fork. Add crumbled dried mint and mix. Put some cheese scattered to cover the surface of the phyllo. As you roll press the two edges so that the filling will not come out. After each roll, brush it with olive oil and when done, twist the two ends towards opposite direction. This will stretch the dough and make it even bigger. Take one end, put it in the baking tin and make a coil. If using a square or rectangular baking tin, place it next to the other in a row, preferably again spaced apart. Brush the phyllo on top with olive oil. At this stage you can cover it with cling film and freeze it. In half of the cheese I added an egg. Rolling and brushing to separate layers. Preheat oven to 180o C / 350ο F and bake for about 1 hour or until golden on top. wow that looks really crisp and the cheese filling sounds just wonderful! Thank you for sharing, I will do it for my relatives. The pie looks really yummy especially with the cheese filling. I will definitely try out this recipe and share with my friends, Thanks for sharing. Very delicious, i can’t wait to make it. Thanks for sharing.